This topic discusses how to configure properties using the Cloudera Manager "new layout." The older layout, called the "classic layout" is still available. For instructions on using the classic layout, see Modifying Configuration Properties (Classic Layout). The Scope section of the left hand panel organizes the configuration properties by role types; first those that are Service-Wide, followed by various role types within the service. When you select one of these roles, a set of properties whose values are managed by the default role group for the role display. Any additional role groups that apply to the property also appear in this panel and you can modify values for each role group just as you can the default role group. The Category section of the left hand panel allows you to limit the displayed properties by category. Many configuration properties have different values that are configured by multiple role groups. (See Role Groups). 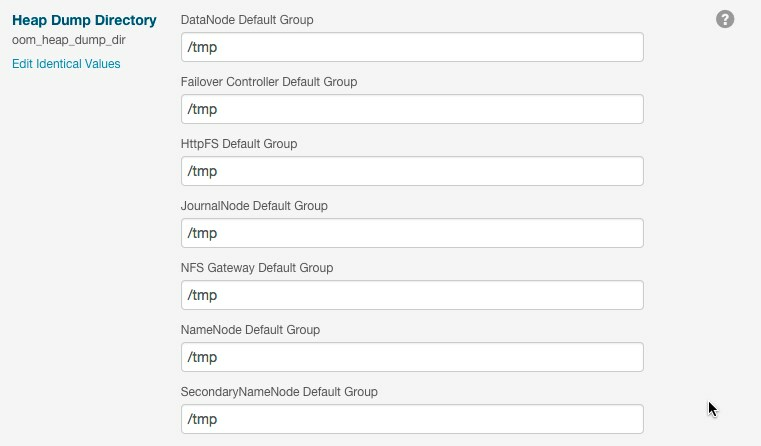 Go to the property, For example, the configuration panel for the Heap Dump Directory property displays the DataNode Default Group (a role group), and a link that says ... and 6 others. Click the Show fewer link to collapse the list of role groups. Click Save Changes to commit the changes. You can add a note that is included with the change in the Configuration History. This changes the setting for the role group, and applies to all role instances associated with that role group. Depending on the change you made, you may need to restart the service or roles associated with the configuration you just changed. Or, you may need to redeploy your client configuration for the service. You should see a message to that effect at the top of the Configuration page, and services will display an outdated configuration (Restart Needed), (Refresh Needed), or outdated client configuration indicator. Click the indicator to display the Stale Configurations page. You can use the Search box to search for properties by name or label. The search also returns properties whose description matches your search term. You will most likely need to restart your service or role to have your configuration changes take effect. See Stale Configuration Actions. To see a list of all role instances that have an override value for a particular configuration setting, go to the Status page for the service and select Status > Has overrides. A list of configuration properties where values have been overridden displays. The panel for each configuration property displays the values for each role group or instance. You can edit the value of this property for this instance, or, you can click the icon next to an instance name to remove the overridden value. To reset a property back to its default value, click the icon. The default value is inserted and the icon turns into an Undo icon ( ). Explicitly setting a configuration to the same value as its default (inherited value) has the same effect as using the icon. You can override the properties of individual hosts in your cluster. Use the Filters or Search box to locate the property that you want to override. Click the Manage Host Overrides link. The Manage Overrides dialog box displays. Select one or more hosts to override this property. A new entry area displays where you can enter the override values. In the example below, servers ed9-e.ent.cloudera.com and ed9-r.cloudera.com were selected for overrides. Note that the first set of fields displays the value set for all hosts and the two sets of fields that follow allow you to edit the override values for each specified host. icon next to the hostname. To apply the same value to all hosts, click Edit Identical Values. Click Edit Individual Values to apply different values to selected hosts. If the property indicates Requires Agent Restart, restart the agent on the affected hosts. 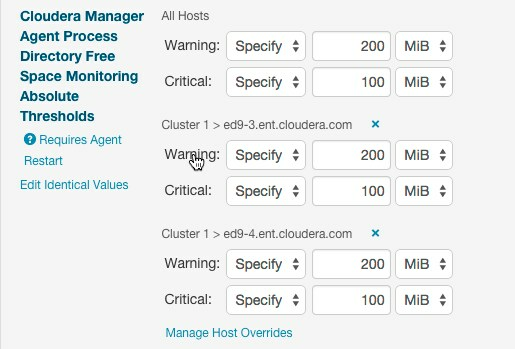 You can suppress the warnings that Cloudera Manager issues when a configuration value is outside the recommended range or is invalid. If a warning does not apply to your deployment, you might want to suppress it. Suppressed validation warnings are still retained by Cloudera Manager, and you can unsuppress the warnings at any time. You can suppress each warning when you view it, or you can configure suppression for a specific validation before warnings occur. Click the Suppress... link to suppress the warning. A dialog box opens where you can enter a comment about the suppression. Browse to the Home screen. Click Configurations > Configuration Issues. Locate the validation message in the list and click the Suppress... link. The suppressed validation warning is now hidden. Click the Show # Suppressed Warning(s) link to show the warnings. Each suppressed warning displays an icon: . Click the Unsuppress... link to unsuppress the configuration validation. Click the Hide Suppressed Warnings link to re-hide the suppressed warnings. Go to the service or host with the configuration validation warnings you want to suppress. A list of suppression properties displays. The names of the properties begin with Suppress Parameter Validation or Suppress Configuration Validator. You can also use the Search function to limit the number of properties that display. Select a suppression property to suppress the validation warning. From the Status page of a service, select Configuration > Category > Suppressions and select Status > Non-default. From the Host tab, select Configuration > Category > Suppressions and select Status > Non-default.